Piles of pumpkins, scads of squash, gatherings of gourds...it's fun to fill the front porch or dining table with fruits of the harvest. Growing them is a great beginner-gardener or child-friendly project. Here are tips for growing decorative fruits of the harvest. I'm all for supporting my local farmers and produce stands. But here's an inspring idea for beginner gardeners: grow your own fall harvest decor. Pumpkins, gourds, squash, and corn are relatively fuss free to grow, fun to show off, and some can be eaten when you get tired of looking at them. Shop for seeds over the winter, or buy them at local stores in spring, and you'll be all set. Pumpkins — the must-have fruit in fall arrangements. We all know and love the "over the top intensely orange" classic pumpkin. They range in size from tiny to tremendous. These days you can mix it up with white pumpkins, both big and small. Pumpkins are pretty easy to grow. 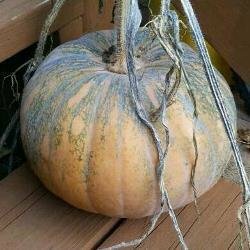 The biggest challenge to growing pumpkins may be the "real estate" they need; a ten foot by ten foot open space is a minimum, and you can rarely predict just where those vines will try to go! The bigger the fruit you want, the bigger the plant (vine) has to be to make it, and the more water and fertilizer it will need. 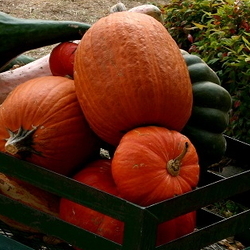 Seeds for a variety of pumpkins are sold by most every seed vendor. Shop online anytime, or sign up for a catalog and use your cold winter nights for browsing through lists of tempting seeds. Johnny's Select Seeds for example, sells 67 varieties of pumpkin seed. In-store seed displays in spring will include a standard hefty orange jack o lantern type and maybe a few novelty pumpkin types, too. 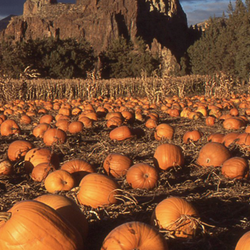 Gourds are related to pumpkins; some are even the same species as many pumpkins. Gourds have been cultivated worldwide for millennia, and have been developed into dozens of varieties. Seeds companies also sell gourd seeds to homeowners. At the least, expect to see a choice of either large mixed kinds or small mixed kinds. Look to the better seed catalogs and specialty websites for more fun choices, like apple or swan gourds, and the other fabulous fancy gourds you see at the market. Most colorful gourds will last several weeks. The hardshell types, such as birdhouse gourds, will dry as hard as wood over winter and eventually live a second life as craft material. Squash offer even more colorful and interesting fruits for your decor and eventually your kitchen. Squash are another pumpkin sibling. In fact, squash and pumpkins are all members of a few species that have been bred into all those colorful fruits of different sizes and shapes. It might even be more accurate to say pumpkins are orange squashes. Summer squash are too tender for weeks of display, it is the winter squash (butternut, acorn, delicata and many more) you'll use for decor. Winter squash types add red, dark green, and grey-green hues to the palette. These three are such close cousins that the growing needs are very similar. Plant 3-5 seeds in a group, in early summer once soil has warmed, in fertile soil and full sun. Keep just three healthy plants of each clump. Multiple plants are needed for fertilization. Give them room to spread, and the bigger the fruit the more room the plant will need in general. Small fruited types may climb a trellis. Big gourds also climb very well; make sure their trellis is sturdy. They are ready to harvest when the skin and attaching stems are hard. Cut the stem, rather than pull the fruit off the vine. A bit of stem helps prevent rotting. Keep the fruit warm and dry after harvest. You may wash it with milld soap and disinfectant, drying the fruit afterwards. Use floor wax on the fruits to make them shine, unless you plan to eat them. Vegetable oil may enhance the color on squash that you plan to eat later. A note about pumpkins, gourds, and squash: if you grow more than one kind, the fruit may contain hybrid seed. If you save your seed for growing the year after, you may get a novel, one-of-a-kind new decor fruit! 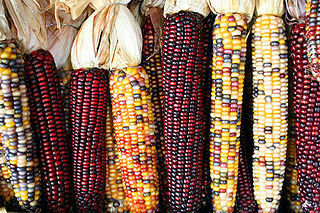 What's a cornucopia without corn, specifically that dried ornamental corn with kernels of red, purple and yellow? You can grow these too, if you have space left in the garden. Corn is best grown in a "block" six feeet square, or in at least four rows. This allows for better pollination and ears with no missing kernels. Some smaller corn can grow in clumps as part of the landscaping, just like a tall ornamental grass. Colorful corn for decoration are the same types that are used for corn flour or popcorn. After the decoration is done, you might play with popping or grinding your pretty corn. See seed catalogs for specifics about the uses for each kind of dried corn. Victory Seeds, for example, has nearly a dozen kinds of seed for colorful dried corn ears. Plant corn once soil has warmed well, in at least four rows or a six foot square "block." Give corn full sun, and water an inch per week. Corn blooms at the top of the stalk, but ears form on the sides, 2 or 3 per stalk. Pick them anytime after the husks begin to dry. Broom corn (sorghum,) is related to corn but has colored seeds arising in a spray at the top of the stalk. Grow broom corn as a large-scale decorative annual grass in the landscaping. Then use the stalks as faux cornstalks, or cut the tops and use in wreaths or dried arrangements. Final notes: If you have already bought the above items for decor this year, consider saving seeds from them to grow next summer. But keep this in mind: those seeds may not produce identical fruit next year. Orange pumpkins, in my experience, generally give you more orange pumpkins, because they probably grew among thousands of identical siblings in a huge field. But many squashes, gourds, and pumpkins will interbreed. The fruit grown from these seeds may look quite different, showing a random blend of characteristics. You might get a unique, one-of-a-kind "squmpkin." or corn. The picture at right shows a volunteer from my garden, some sort of wayward butternut. 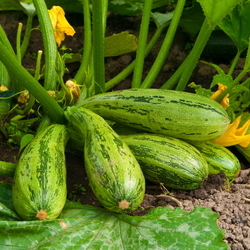 Corn and the various squashes and gourds can be grown together with beans in a large plot. Native Americans were said to plant this way. The method is called "Three Sisters" planting. Read about it in detail in this article "Three Sisters Garden: Corn, Beans, and Squash" by Alice Formiga, published at Renee's Garden.